Senate probes alleged lopsided recruitment in DSS – Royal Times of Nigeria. 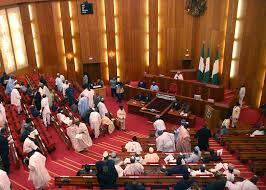 The Senate Committee on Federal Character and Inter-Governmental Affairs said it has commenced investigation into the alleged lopsidedness recruitment of cadet officers in the Department of State Services (DSS). The Chairman of the Committee, Tijjani Kaura, who disclosed during Thursday’s plenary, said the committee would soon come up with its recommendations. Quoting Order 43 of the Senate Standing Order, Kaura said the committee was prompted to commence investigation into the matter following petitions from some concerned Nigerians. He assured that the committee would stop at nothing to ensure that the issue of federal character as contained in 1999 Constitution (Amended) was followed to the letter. Kaura said, “I stand before you, on behalf of Senate Committee on Federal Character and Inter- Governmental Affairs, to say that this committee is looking critically into this matter. “This is with the intention of ensuring that justice is done in this recruitment. In his remarks, the President of the Senate, Bukola Saraki, urged the committee to carry out thorough investigation into the matter and report back to the Senate. He said, “In line with our standing rule, we cannot debate on the matter. We take note of your comment and we will look into the matter.